Presented by husband and wife members Yvonne and Brian Mitchell in 2013. When Brian won ‘Best of the Year’ in the General Group for his print ‘Dead Head’ in 2013, Yvonne said he would have a trophy to dust in the year ahead. When the awards were distributed at the AGM, it turned out there were no trophies for any of the ‘Best of the Year’ winners. This seemed a little surprising, as all the winners of the individual competitions throughout the year received trophies. Another ‘Best of the Year’ winner commented on this, albeit in jest. Brian and Yvonne decided it would be a nice gesture to provide a trophy for future winners of this category and it was named the ‘Team Mitchell Trophy’ as they enjoy their photography together. It didn’t occur to them that Brian would be presented belatedly with the award in the following September, but it was amusing to see Brian’s face when he collected his own trophy! As in all clubs, if there is a member with accountancy knowledge, he or she is usually asked to audit the Annual accounts. Fordingbridge Camera Club is no exception and so when it was learnt that Brian had an audit background he was approached to undertake this duty, which he continues to do at the time of writing this review. 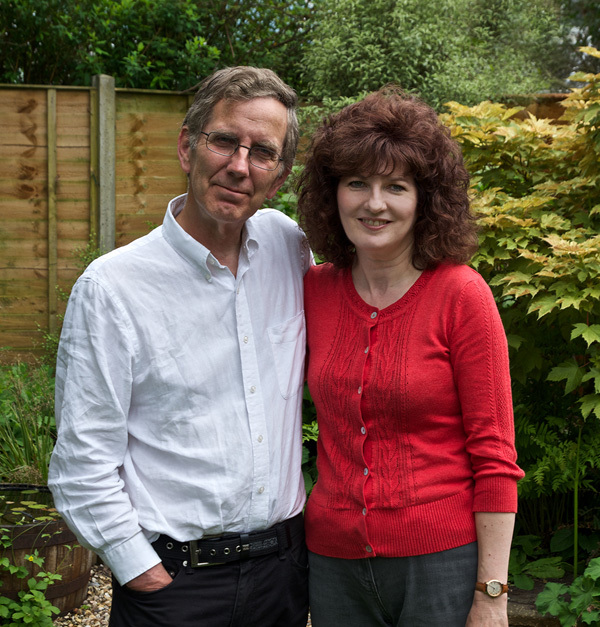 The photograph shows Brian and Yvonne in their garden in 2014.